Whether you’re living in your dream home or in a residence that is more like a handyman’s special, you’ll want to refresh or update things from time to time. That being said, it can cost thousands or tens of thousands of dollars for major renovations such as totally redone bathrooms, kitchens, or basements. 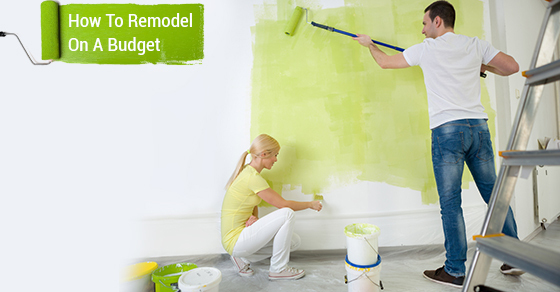 If you don’t have that kind of money and would rather not go into debt by financing a major renovation project, you’re in luck because there are relatively cheap ways to give your home a new look that you’ll be proud of. One relatively inexpensive way to remodel your home on a budget is to head over to your neighborhood big box store and pick up some new window coverings. New blinds or curtains will give your various rooms a new, updated look that will sure bump up your home’s visual appeal. One of the easiest and most cost-effective ways to remodel your home is some paint. A gallon or two of paint can have your home looking almost as good as new. While you’re at it, change the trim in any room you decide to paint, and don’t forget to paint the trim as well. If you’ve got drab carpets or chipped, dingy tiles installed, you can really give your home a cost-effective upgrade by re-doing some of the flooring. On any given week, you can find great deals on laminate flooring or tiles. If you can do the work yourself, you can reduce your expenses even more. If you don’t have the money to go out and buy new furniture, you can instead try a much cheaper alternative. Sofa coverings, available in various textures and styles, will help you to change up the way your house looks. Another cost-effective remodeling project involves adding more natural light. Instead of having a contractor cut out a hole in a wall to add another window, you can install something known as a light tube between the rafters of your roof. This will effectively funnel sunlight inside your home. By doing this, you can get more natural light at a fraction of the cost of building new windows. Remodeling need not cost you an arm and a leg. For a bargain, you can upgrade and revamp your home and make it an even more pleasant place to be for you and your family.